Sandy Carter is Vice President, SOA & WebSphere Strategy, Channels and Marketing for IBM Corporation. Sandy is responsible for driving IBM's cross-company, worldwide SOA marketing initiatives, and in this role, helps oversee the company's SOA strategy across software, services and hardware and sets the company's SOA marketing direction. It was a vision of musical stardom as a Detroit teen that inspired Mary Wilson to co-found one of the most successful female singing groups in recording history - The Supremes. Since then, Wilson has gone on to be a part of dozens of hit records, has written a best-selling autobiography, performed on stage and screen, lectured and toured the world, and continues to be looked up to as a singer who set the standard for females in the recording industry. Register Before March 7th and SAVE $100 Off Full Conference Registration! That's just $299 for both days (save $100! off the regular registration pricing) when you enter the promotional code 101WITI (the code will automatically populate when you register from the WITI site). This offer ends March 7th so Register Now! WITI Las Vegas Founder Laura Fucci is Appointed Chief Information Officer of Clark County, Nevada! Laura Fucci, founder of the WITI Las Vegas Network, has been appointed as the Chief Information Officer at Clark County, Nevada. Clark County is home to the world-famous Las Vegas Strip, heart of the Entertainment Capital of the World and site of 14 of the nation's 15 largest hotels. In addition to hosting more than 38 million tourists annually, Clark County is also one of the fastest-growing areas in the country, with more than 5,000 people moving here each month. Laura, a native to Southern Nevada, is excited to take on this new position where she can contribute to the community through the use of technology and help prepare the County for further growth. Laura brings a rich background of leadership and technical experience with her to this public role. Prior to joining Clark County, Laura was the VP and Chief Technology Officer for MGM MIRAGE, one of the largest casino resort companies in the world. WITI Hall of Famer Frances E. Allen Honored with the Prestigious $100,000 Turing Award... Congratulations Fran! Frances E. Allen, 74, was honored for her work at IBM Corp. on techniques for optimizing the performance of compilers, the programs that translate one computer language into another. This process is required to turn programming code into the binary zeros and ones actually read by a computer's colossal array of minuscule switches. Inspiration comes in many forms. Chicago's "Excellence in Corporate IT Leadership" Award sought to recognize a diverse set of inspirational paths and experiences. The organizations under the stewardship of the Awardees had a unique set of challenges. Their companies are from the private and public sectors, and academia. And by showcasing their paths to leadership, it is clear that it is not one path, but many we can learn from. 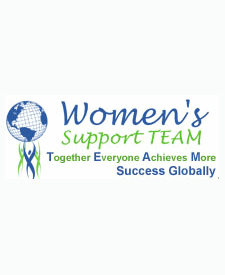 Women's Support TEAM is your key to a less stressful - more successful life... so that Together Everyone Achieves More Success Globally. WS TEAM is for women to help other women achieve more success with less stress globally... all by sharing what they are passionate about and what love to do... in effect by "packaging" themselves. When women create and market downloadable informational products (DIP), they can reach and help so many more women than otherwise possible.